The extra steps we take to insure quality construction keep us in front. Our tough standards are designed to make dependable barges that work hard and yield a fast return on investment. be rotated for maximum downhand welding. In addition, all metal parts exposed to corrosive underwater conditions are sequence welded to eliminate distortion. Gantries enable us to construct bows, sterns, keels and sides in the area of the yard that will provide the most efficient use of manpower and equipment. These gantries then de- liver subassemblies to the final as- sembly area near the launch ways. The end product is a superior vessel crafted to accurately meet our customer's fleet requirements. 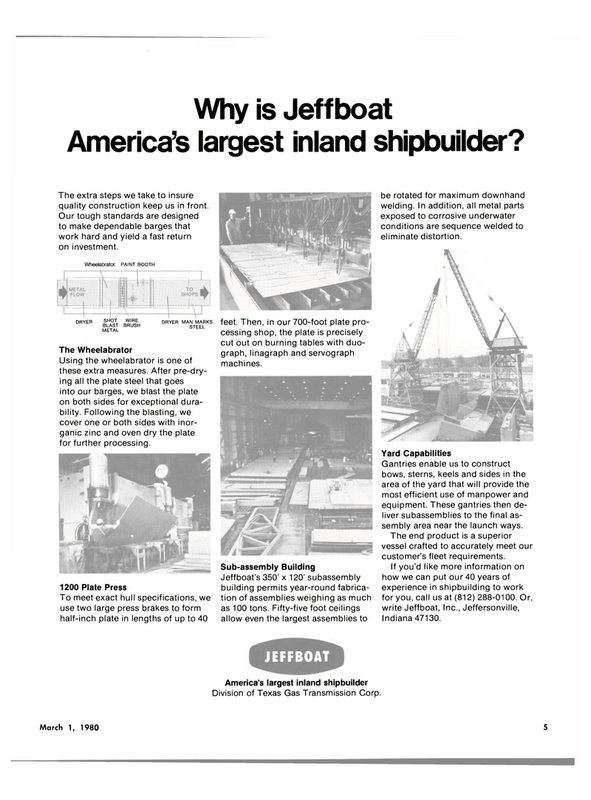 Jeffboat's 350' x 120' subassembly building permits year-round fabrica- tion of assemblies weighing as much as 100 tons. Fifty-five foot ceilings allow even the largest assemblies to feet. Then, in our 700-foot plate pro- cessing shop, the plate is precisely cut out on burning tables with duo- graph, linagraph and servograph machines. Using the wheelabrator is one of these extra measures. After pre-dry- ing all the plate steel that goes into our barges, we blast the plate on both sides for exceptional dura- bility. Following the blasting, we cover one or both sides with inor- ganic zinc and oven dry the plate for further processing. Division of Texas Gas Transmission Corp.